If you've ever been to a Music and Marys at the distillery -- you can thank Jaime because she books the music AND whips up quite the Bloody Mar bar. What’s your role at SILO and how long have you been a part of the team? I work the tasting room at the distillery and I’ve been with the team for about 4 1/2 years! Looking back (almost 5 years!!) what would you say is your favorite part of the job? I love meeting people from all over and educating them about our product and how it's actually local. From the barrels, to our ingredients and the bottling -- it's all done in Vermont. When folks comes in to the distillery and ask for a cocktail suggestion — what are your recommendations? I tend to favor the Lavender and the Cucumber vodka especially this time of year. The SILO Citrus and Lavender Lemon are classics. You've got the day off, what are you doing? Definitely spending time with some friends and family outside in the sun. I'm always happy to find some water or mountains, whatever the weather allows. Any exciting events in the works at the distillery? We are in the process of planning a big Fall party on the patio! Also - my focus is getting some more fun music in for Music and Marys which we host on Sundays. Coming up this week (July 15th) we have Strangled Darlings - hope to see you there! The piglets were born last month... right around one of Vermont's freak Spring snowstorms. This past Wednesday we stopped by SpringMore Farm in Baltimore, VT. 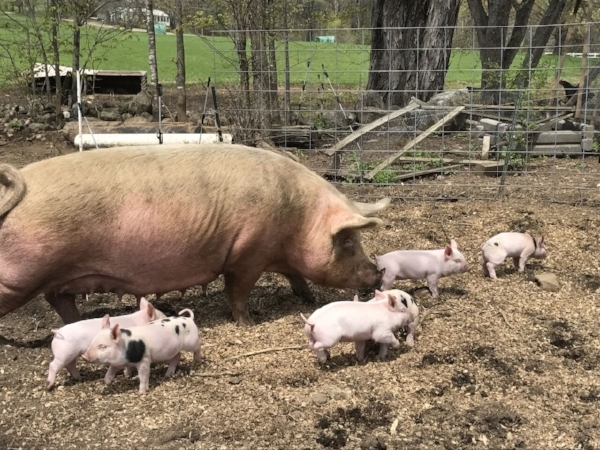 The sun was shining, the piglets were well… adorable as always, and we got some time to check in with owner John Lomachinsky about how things were going. SILO’s relationship with SpringMore began back in early 2016 when we began purchasing cucumbers from their farm and donating our spent grain to their pigs. As we wandered down to the electric green pasture to greet the Scottish Highlanders John filled us in on a certain myth. If you’re like us, you might be asking… "um how??" It’s the same idea as when you mow your lawn. When animals graze, trimming the grass, they allow the grass roots to decompose more frequently, thus creating richer organic matter in the soil. Add some chicken manure in, which is high in nitrogen, and you’ve got some healthy grass on your hands. But this doesn’t happen over night. This process can take up to 5 years before you see impactful results. While at the farm we gawked at the newly born piglets. Because we're human after all. 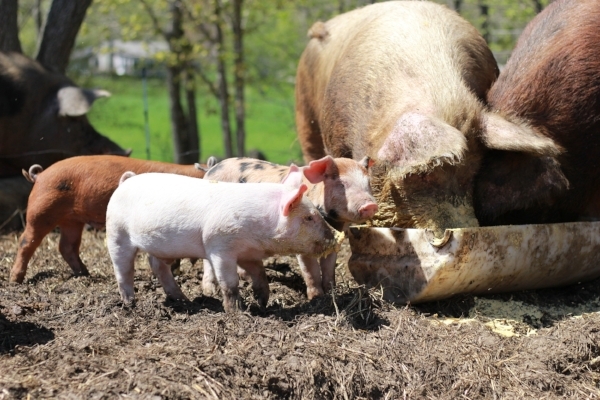 SILO's Non-GMO spent grains get sent to SpringMore Farm to help feed their pigs. His favorite time of year on the farm is Fall. Martha Stewart was once a regular at a farm he worked at in New York. She would pick pumpkins and buy her Christmas tree there. He met his wife (and co-owner) Becky on a farm when they were in college. This July SpringMore will celebrate 10 YEARS IN BUSINESS. Congratulations! Interested in learning about full circle farming and what that means? Look no further. You might have met her behind the bar at SILO, or at a local event, or you might not know her at all. In that case, meet Mary - she’s wonderful! I've proudly been with SILO since November 2014. Peter and Anne Marie (the owners) were frequent guests at the Barnard Inn where I was bar tending (and serving up lots of yummy SILO cocktails.) They asked me to come to SILO at just the right time in my life. SILO hosts many events for the community including Music and Marys, Paint and Sips, as well as private events. What has been the most fun event to host, so far? I have done so many of our events over the years, it's hard to pick one. I would say the one that is the most fun for me is “Taste of Woodstock” each summer. I get to see so many locals, business owners, friends, and of course visitors. The reaction of people seeing SILO there for their tasting pleasure is always fun. I have always enjoyed the VT Bartender of the Year competition too. We have so many incredibly talented mixologists here in Vermont. Say you've got the day off, what are you doing? In the winter I might go for a snowshoe, come home and get the woodstove going and grab a book! If I plan a Saturday off, you'll find me with my four grandchildren either playing at my house or out for an adventure. Our latest was to the Fairbank's Museum and Planetarium. What a wonderful time we had. When folks comes to the distillery, what is the most ordered cocktail? I think it's a toss up between our SILO Citrus with our cucumber vodka, or the Fall in Vermont with our maple whiskey. The "Fall in Vermont" with our SILO Maple Whiskey made with 100% Organic maple syrup from Sugar Moon Hill Farm in Woodstock, VT.
What is your favorite SILO cocktail to whip up? My favorite SILO cocktail to whip up is a SILO Lavender Cosmo.... aptly named the "SILO Spring". The reaction of those enjoying the cocktail is always one of pure delight, and most of the time they go home with a bottle of SILO Lavender Vodka to make their own cosmos at home. SILO Single Malt is here! Spirits are exotic, attractive, exciting beverages. They call to mind numerous stories and memories. Scotch, in particular, evokes images of leather armchairs, libraries, and old men with monocles and pipes. If you’ve visited the distillery in the last six months, you may have heard me talk about SILO Single Malt. As the first release of our Distiller’s Select series, our Single Malt means a lot to me, especially since the release is planned in conjunction with my wedding! Those who know me know that I am a Scotch enthusiast. Single Malt Scotch refers to Scotch whiskey which is produced entirely at one distillery. While everything we do at SILO is done exclusively at our barn distillery, SILO Single Malt does share the unique smoky profile common to many of its Scottish cousins. Scotch is known for a peaty smoke character which is hard to emulate here in Vermont, so we’ve chosen to smoke with Vermont applewood. This fun, grain forward whiskey is comprised of Vermont-grown barley that has been both malted and smoked by Andrew Peterson at Peterson Quality Malt in Monkton, VT. Aged in our used SILO Whiskey barrels, you’ll experience sweet cereal notes accented by cocoa, honey, and of course the sweet caress of smoked applewood. At 86 proof, it offers both warmth and smoothness. Look for it at our Windsor distillery and in Vermont liquor stores and restaurants starting in late July, and grab a bottle quickly! It’s a limited release! Throughout the last several months we’ve showcased many of the important partners and friends who help us produce our unique SILO spirits. We’ve left out one incredibly important vendor who, while not local, has played an integral role in our development. Operating since 1869, Carl Distilleries is Germany’s oldest distillery fabricator. If you’ve ever seen our still, you may have noticed CARL on the front hatch. No, that’s not his name, but rather the company that made him! CARL worked with our team to develop a still which fit our needs and space. Having the flexibility to design a still helps tremendously in the flexibility of distilling quality products and the expression and identity of the distillery. Our still has a 600 liter charge capacity, meaning we put in 600 liters (about 158.5 gallons) of product into the still. The area which holds this volume of product is called the “Pot”. Heated by a steam bath, the contents of the pot will start to vaporize, traveling up the pot and into a small vertical column above the pot called the “Helmet”. From here, it will travel to one of our two columns: a tall column used exclusively for vodka, or a shorter column used primarily for whiskeys. You see, alcohol has a lower boiler point than water. As we start to heat the still, the alcohol molecules begin to vaporize while most of the water stays behind. The vapor must work hard to move up a column, which results in a stronger spirit. This process ends up concentrating the alcohol in the product, which is why spirits tend have a much higher alcohol content than beer or wine. Finally, the vapor will hit a cooler condensing column and will be turned back into a liquid, which comes out the still. CARL is a phenomenal company who produced a product that certainly makes my life as a distiller much easier. Everything is still manual – we have not automated here at SILO – but it’s a comfort knowing that quality craftsmanship stands between me and producing a quality product. Add ice to a tumbler with Vodka, Pomegranate Juice, Simple Syrup, and lime juice. Since we have a great crew here at SILO, we thought we would introduce you to one of our team members. If you've ever been to an event of ours in Burlington it's most likely that you've met Sarah, our extraordinary brand ambassador. Let's get to know her, shall we? 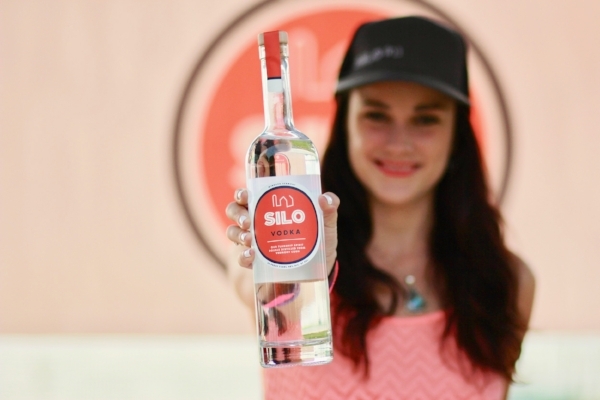 What does your role as “brand ambassador” for SILO include? As brand ambassador, my biggest role is spreading the good word about SILO to bars, restaurants and VT locals. I love being able to talk with folks about our local partnerships and the measures we take to promote sustainable practices. Another big part of my job is working within the local community to collaborate on fun events such as the upcoming Burlington Sip and Shop on Church St or our Valentine’s Day Brunch at the Whiskey Room. I also love doing tastings at bigger events like the Food and Wine festival and Grace Potter’s Grand Point North last summer- both of which had the added perk of spending the day on the waterfront. Either way, it comes easy representing a company that makes such quality spirits that I am genuinely behind! What question are you asked most often? And what’s the answer? I would say cocktail suggestions for our more unique spirits such as Lavender Vodka or Aisling Whiskey would be the questions I get asked the most. It’s fun seeing people be so intrigued by something they may have never experienced before and getting creative with them to come up with cocktails they are really excited about. What brought you to Burlington? I came to VT in May of 2014 with plans to stay just for summer. I have a really big family base here. My mom is one of nine so lots of aunts and cousins! I thought it would be fun to stay for longer than just a week visit. The close knit nature of the community in Burlington and the gorgeous lake and mountains got the best of me, and here I am almost four years later! It's pretty hard not to fall in love... hello Lake Champlain in the Summer! What’s your favorite thing about living here? I would say my favorite thing about living here is the landscape. VT has the best of both worlds- a huge lake and gorgeous mountains. In the winter I love to snowboard. Sugarbush and Bolton are my favorite spots. In the summer I spend as much time I can on the water, at the beach or - my favorite thing - at one of the many local swimming holes. What’s your favorite SILO cocktail to make and why? Cucumber Vodka is my favorite SILO spirit. It is so smooth and clean and always brings me back to summer. My favorite cocktail to make with cucumber is simple and delicious. It’s muddled basil, simple syrup and fresh squeezed lime juice shaken hard with cucumber vodka and poured into a chilled martini glass. It’s so refreshing and the muddled basil and lime juice gives it a really pretty light green color. I like to garnish with a cucumber wedge. Okay thanks Sarah, now you have us all dreaming of warmer days! I guess the snow is pretty great too though. Stop by one of the many events going on in Burlington this month and say hello to our pal Sarah. Vermont Specialty Food Days, Here We Come! For those of us lucky enough to live in the Green Mountain State, we are fully aware of how spoiled we are by the amount of incredible vendors who also call this state home. Another treat for us Vermonters? (On a good year) - the piles of fresh powder that allow us to beat the winter blues and get outside to enjoy our favorite winter activities. As the official vodka sponsor for Ski Vermont we are happy to announce that we will be one of the vendors traveling to various Vermont Ski Mountains and spreading the SILO love during Vermont Specialty Food Days. Is there anything better than cozying up with your favorite spirit after a long day on the trails? We’re right there with you. Come explore new ski mountains and celebrate with us and the SKI VT team! We’ll be in good company with vendors such as Ben and Jerry’s, Fat Toad Farm, Mad River Distillers, Caledonia Spirits, Long Trail, Cabot Cheese, SAP and more. Meet you at the Mountain. We hope to see you for one (or many) of the Specialty Food Days! Barrel aging, or maturation, is an incredibly important part of spirits production. When SILO Distillery first started, we used a mixture of 10 gallon and 15 gallon barrels from Black Swan Cooperage in Minnesota. I’m happy to report that we’ve recently purchased our first set of 30 gallon barrels from Green Mountain Grain & Barrel of Richmond, VT. Using a locally produced barrel made from Vermont wood has long been our goal, and the team at GMG&B has made that a reality! Green Mountain Grain & Barrel was founded by US Army Veterans Tony Fletcher, Mac Broich, and Josh Waterhouse. Producing up to a barrel a day, they handcraft each barrel much akin to the traditional coopers of New England. Sourcing white oak first from Vermont and then regionally, GMG&B first seasons the wood for a minimum of 6 months before producing the staves and barrel heads. For our use, the barrels are charred to specifications which encourage the caramelization of wood sugars and extraction of flavor and color. Since bourbon must be aged in new, charred, white oak barrels we will be using GMG&B barrels first for our SILO Bourbon. Maturation is a complex process, but let’s take a brief look into the specifics. 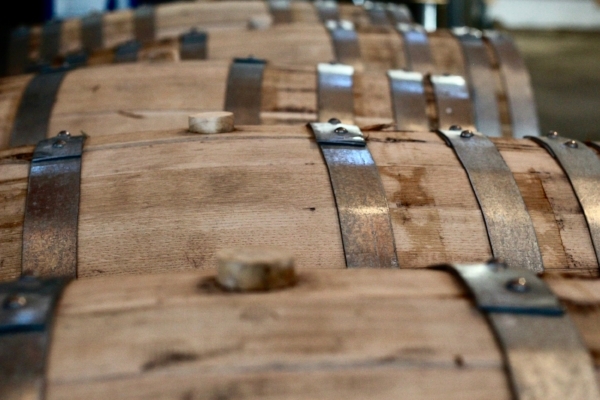 First, spirits are frequently matured in wooden barrels – usually white oak. American white oak trees mature around 70-years-old and are more mellow and aromatic than European white oak trees, which mature around 100-years-old and produce more intense flavors. White oak is cut in very specific ways to encourage proper breathing and to minimize leakage. Aging influences the spirit (say, a whiskey) in many ways. Subtractive maturation refers to the diminishing of unwanted flavors over time. Additive maturation refers to flavors of the cask – wood, vanilla, almond, toffee, among others – infusing into the spirit. Finally, interactive maturation refers to the complex chemical marriage of spirit, environment, and cask. While our aging process in 10 gallon barrels takes only 10-12 months, lest the spirit taste too oaky, the transition into 30 gallon barrels will mean 2+ years of maturation. It’s a shift into which we are excited to dive, and we are thrilled to have Green Mountain Grain & Barrel along for the ride. Tony, Mac, Josh – Thanks, again! The Holidays are always packed with good food, close friends and family, gift shopping, cooking, party planning and more! Sheesh, that's a whole lot to do in a matter of a few weeks, or less. Not to worry folks, we sat down with Mark Addison, entertaining expert and author of the Cocktail Chameleon for some insider tips on how to throw one top-notch holiday soirée. Around the holidays there’s plenty of pressure to be the perfect host. What advice would you give someone who wants to entertain but not spend a ton of time or money? "I think the biggest problem people face is over complicating their party plans (and I’ve been there). You want to try new recipes and give your guests lots of options (just in case they don’t like something) and this is where the fear of throwing a party comes in and why many people just don’t do it! 50% pre-prepared (homemade or not, who’s to know) and 50% that you must prepare the day of your party. This keeps you from overloading yourself, because life always gets in the way of best laid plans – am I right? 50% of your party plan must be in your entertaining repertoire and you can turn it out in your sleep (you may just have to) and 50% new(ish) to keep things fresh. Taste test at least a week before to work out any kinks. To answer in two words: SIGNATURE - COCKTAIL! Signature cocktails are part creative expression and part calling card, alluding to your style as much as your handshake or favorite perfume. It’s wonderful to be able to host a themed evening and mix up a batch of something tailored just to the occasion. The result is a signature cocktail that is as unique as you are. It also simplifies your stock of liquor (saving you money) and gets you out from behind the bar to enjoy your own party. Batching cocktails is the most efficient way of managing your cocktail offerings. Choose a recipe that can be scaled up into a pitcher by multiplying it by the number of guest you want to serve. Place it into the refrigerator until ready to serve and finish off with a garnish or top off with a sparkling mixer just prior to serving. The 50/50 rule put to the test…!" What is the most-common entertaining question you get? It depends on what is being shaken or stirred…the purpose of ‘shaking’ a cocktail is to break-up the ice and agitate the liquids, resulting in a well-combined drink with a thin layer of ice chips on top. The act of ‘stirring’ gently chills and blends the spirits’ flavors without diluting the drink. Both techniques appear in my book according to the ingredients involved and the result that’s desired. Now, keep in mind that there are rules pertaining to ingredients that should never be shaken, such as tomato or pineapple juices, as doing so would cause them to foam and produce an undesirable appearance and texture. I believe the particular cocktail dictates the appropriate treatment. Only use fresh ingredients: There is no substitute for all fresh ingredients in cocktail making that deliver the best quality ingredients to make your cocktails the best they can be. Readymade mixers and bottled juices are acceptable only when fresh ingredients are out of season. Infuse your own spirits: homemade infused spirits impart the truest flavors with levels of complexity that cannot be matched in artificially flavored spirits. 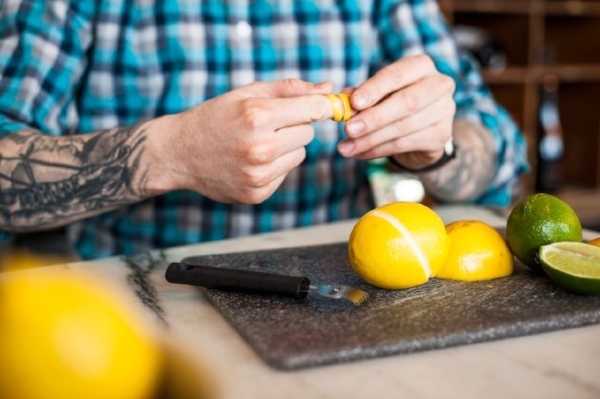 Don’t forget to garnish: Garnishes are key to defining a cocktail’s personality and are another place to have fun. From a single twist of lemon to a skewer loaded with meats, cheese and/or vegetables, these adornments look festive but aren’t just for show. They signal what the drink is all about and add complementary flavors. Cocktail etiquette dictates that an even number of garnishes is unlucky, so remember to stick to odd numbers when dressing up your glass." What is in your holiday entertaining tool-kit? A cocktail spoon for cocktails that require stirring as well as fetching garnishes such as olives, cocktail onions and cherries out of their narrow mouthed glass jars. Can you suggest a perfect hors d’oeuvres and cocktail pairing? For cocktail parties, I like to create a Meze-style buffet, which is a middle eastern word for a selection of small dishes served to accompany alcoholic drinks. A Meze typically consists of sliced breads and spreads, fruits and small finger food that guest can “graze” over selecting items to make their own small plates. During the holidays, champagne cocktails are very popular and items that go well with sparkling beverages are smoked fish, meat and vegetable spreads or mousse, fresh berries, herbed soft cheeses, spiced nuts and nut encrusted cheese balls. Desert Meze buffets are equally festive to present with Champagne Cocktails with a selection of petite fours, macaroons, sugared fruits and liqueur infused chocolate truffles." Lucky for you SILO has a champagne-forward cocktail called the Lavender Libation (shown below.) Mix it up at your next get-together, or enjoy with best-friend or S.O. 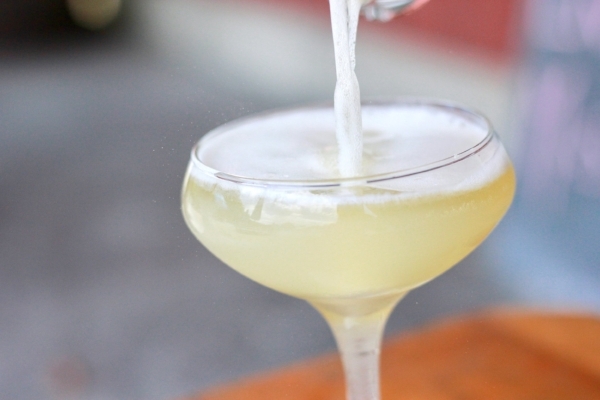 Combine the vodka, lemon juice and simple syrup in a flute and top with prosecco, garnish with a lavender sprig. In 1919, the Eighteenth Amendment to the United States Constitution prohibited the production, transportation, and sale of alcohol. Known as Prohibition, this period addressed widespread overindulgence (and its associated health and social risks) while simultaneously fueling illicit activity and organized crime growth. America’s “Noble Experiment” of Prohibition ultimately failed, leaving behind a crippled alcohol industry and an American population thirsty for sweetened beverages and sodas. In effect for 13 years, it was repealed on December 5, 1933 by the Twenty-First Amendment which once again legalized alcohol production, distribution, and sales in the US. Holiday season is upon us with cause to celebrate at every corner. What’s one more reason to raise a glass? Well, for us, it’s a pretty important one! Repeal Day marks the seed which ultimately grew into the US wine market, which budded into the tour de force of US craft beer, which is now flowering into an eager and emerging US craft spirits industry. It’s pretty awesome! While illegal speakeasies were a thing of the roaring 20s, now they are fun, retro-styled establishments typically featuring hand-crafted gastropub fare and a delightful mix of classic and contemporary cocktails. Speaking of classic, prohibition era cocktails… Here are a couple favorites! Stir with ice, strain, pour over a large ice cube. Shake with ice and strain into a cocktail glass. Substitute cherry kirsch for maraschino liqueur if necessary. In the spirit of celebration, SILO Distillery is going to be attending the Woodstock, VT Wassail Weekend on Saturday, December 9 from 11:00am onward. The Woodstock Inn will be serving a SILO Bourbon Punch and we will have spirits for tasting and purchase! Wassail is a timeless tradition hailing from an old Anglo-Saxon greeting and is traditionally accompanied by a beverage of the same name. I’ve been Wassailing for years, and there’s no better holiday beverage in my mind! Hope to see you all at Wassail Weekend. Whiskey season is upon us. Those who know me know that I’m a big fan of brown spirits – the warmth, the history, the cocktails. With that in mind, I thought it would be nice to introduce you to our whiskey trio and a few of their friends. A 100 proof whiskey made from equal parts corn and rye. With its high rye content and strong presence, this overproof whiskey shines in classic cocktails like the Sazerac, Manhattan, and Boulevardier. Aged in our used bourbon barrels, it is grain forward with a light graham cracker and honey sweetness. 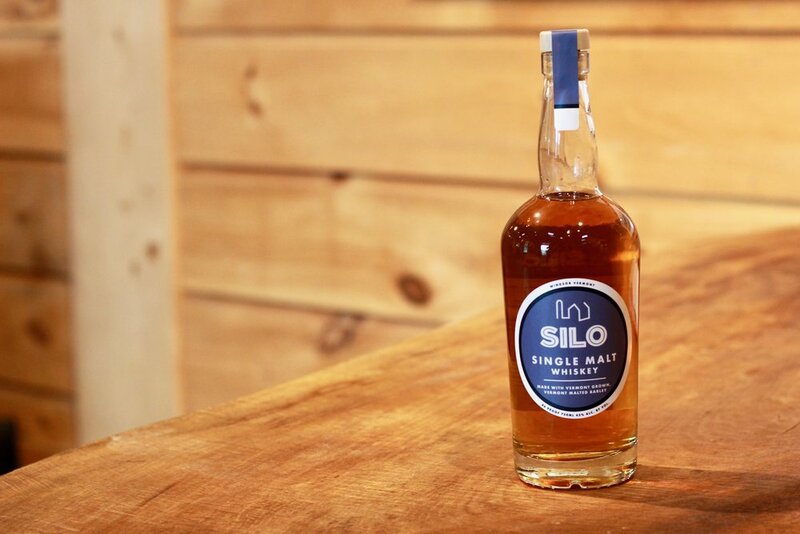 SILO’s take on “America’s Native Spirit” offers a bourbon comprised of 70% corn and 30% rye. By law, bourbon has to be at least 51% corn, aged in first use white oak barrels, and must be placed in those barrels at no greater than 125 proof (62.5% ABV). It must be produced in the United States and, like all whiskeys, must be distilled below 160 proof and bottled above 80 proof. SILO Bourbon offers notes of rye, vanilla, plum and cherry. Currently aged in 10 gallon barrels from Black Swan Cooperage in Minnesota, we are excited to accounce a shift to 30 gallon barrels produced here in Vermont by Green Mountain Grain % Barrel. The newest edition to our whiskey family, SILO Maple combines the warmth of a high rye whiskey with the sweetness of local maple syrup from Sugar Moon Hill Farm in Woodstock, VT. A welcome addition to the classic Manhattan and Old Fashioned, SILO Maple also shines amidst holiday classics such as mulled cider and eggnog. Aisling, pronounced ASH-LING, is a Gaelic word meaning “dream” or “vision”. A limited release, we aged a 100% wheat whiskey with local charred ash wood. The result, a delightfully light and accessible sipping whiskey with notes of toasted almond, marshmallow, and honey, appeals to entry level whiskey drinkers and connoisseurs alike. In particular, Aisling reminds me of an Irish style pot still whiskey. Finally, I’d like you to meet SILO SINGLE MALT, coming soon to a distillery near you. Slated for a July 2018 release, our limited release Single Malt whiskey is distilled from barley grown and malted by Vermont’s own Peterson Quality Malts. Half malted barley and half Applewood-smoked malted barley, it is shaping up to be a really fun spirit reminiscent of lightly smoked Scotch. 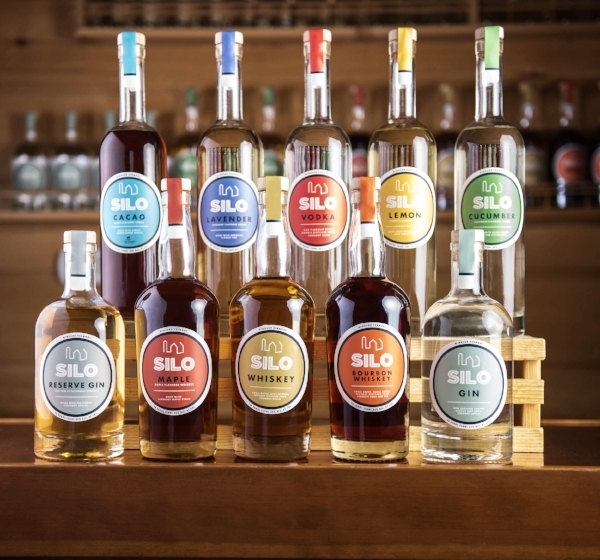 Whether you are just getting into whiskeys or have a collection to rival the best of them, I hope that you can find something at SILO to wet your whistle. Winter is coming, and few things are better than a nice, warming dram of your favorite dark spirit. Learn how to make SILO's Maple Toddy in 30 seconds or less. Pick your favorite mug and let's get started! Grand Point North. What an incredible weekend. This past weekend was a homecoming on many different levels. Along with Grace Potter’s return to her home state, the crowd was treated to 3/4 of a Phish reunion with headliner Trey Anastasio inviting long-time band members Mike Gordon and Paige McConnell on stage. Potter, Anastasio and Gordon even closed the pre-encore with Phish’s Water in the Sky. It was truly a wonderful way to pay tribute to Burlington and all of their loyal fans. With acts such as Dawes, Joseph and Vermont locals Barika, Smalltalker, Lake Superior, SnakeFoot, The Welterweight, Eastern Mountain Time, Henry Jamison and Troy Millette & Dylan Gombas, Burlington was a special place to be this past weekend. Joseph performs during sunset on Sunday. We were especially excited to introduce Burlington to our Grand Point North-inspired cocktails including the “Ooh La La” and “Nothing But The Bourbon.” Thank you to those who stopped by to chat with us and try our cocktails. We were beyond grateful to be a part of this annual Vermont staple and meet so many enthusiastic supporters of our mission. Keeping it local and supporting our small, yet inventive state is what it’s all about. Our Burlington brand ambassador Sarah. With summer-like weather, an all-star lineup, local food and smiling faces, this weekend was the perfect culmination to Summer. Oh and did we mention the sunset? Late Summer sunsets are the best. If you missed out on the cocktails this weekend, you’re in luck. Try making these in your own kitchen! Grain to glass. Farm to table. Consumers are growing more and more familiar with the transparent supply chain championed by the craft scene, but what does that mean for us at SILO? Enter Jeff Grembowicz of Grembowicz Farm in North Clarendon, VT. Jeff supplies one hundred percent of the non-GMO corn, rye, and wheat used to produce SILO spirits. It’s quite an undertaking! Every week or two, he hand-delivers five tons of grain pre-bagged in 50 or 56 pound increments. We unload the truck by hand, restacking it on pallets in our shipping/receiving room. No need to visit the gym on grain days! So why is our relationship with Grembowicz Farm special? For starters, finding a Vermont-grown non-GMO grain was of paramount importance to the SILO team. As with any food product, quality begins with raw ingredients. Committing to local ingredients means not only having a better understanding of a product and its source, but also reducing fuel consumption and supporting the local agricultural economy. In a world increasingly inhabited by digital relationships, it’s also nice to develop a more personal connection with our farmer-vendor-friends. Being able to speak with Jeff at a moment’s notice is incredibly reassuring. Maybe I’ve had a bad week and fell behind. Maybe we’ve been cruising and are ahead of schedule. It only takes a phone call to adjust our schedule. Jeff’s grain doesn’t hang around the distillery for long. Shortly after delivery, the first bags are wheeled to our mill room where they pass through a hammer mill and are ground to the consistency of grits. From there, it’s up the augur and into the mash tun. Thus begins the process of producing the SILO craft spirits we all know and love – handcrafted and hand-grown. I grew up in Virginia’s Shenandoah Valley, amidst the same mountain range which SILO calls home. I attended the College of William and Mary in Williamsburg, Virginia where I studied Historical Archaeology and Environmental Policy. My mentor, archaeologist Fred Smith, quite literally wrote the book on the history of Caribbean Rum, and that’s where my interest in spirits began. I spent the summers of 2008 and 2009 in Barbados, first doing fieldwork on sugar cane plantations, and then studying the local food and beverage scene. In June of 2015, I accepted the position here at SILO and moved to the Upper Valley. My philosophies and those of SILO are closely intertwined. We commit to furthering the local and regional agricultural economies through the act of distillation. We seek to educate consumers about spirits and their production and consumption. A well-crafted beverage may be a beautiful addition to a meal or gathering and we truly hope that you’ll join us at the distillery to experience just that. This Summer SILO is teaming up with The Skinny Pancake to deliver even more local love to the Upper Valley. With the sun shining, the Bloody Mary bar stocked, Woodstock native Andrew Prior on the guitar and homemade Kimchi crepes on the menu; Skinny Sunday hit all of the senses last Sunday. From the homemade "Kim-cheese" to the classic Lumberjack - Skinny Pancake strives to provide local food to communities within the Upper Valley and beyond. As a major proponent of supporting local farmers and using quality ingredients ourselves; we were thrilled to have them. Wondering how you can make your very own SILO signature Bloody? 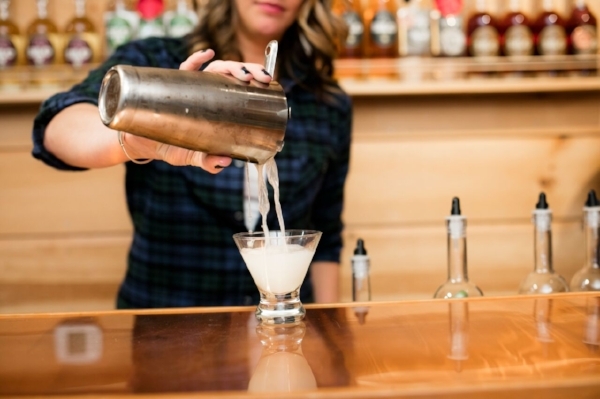 Learn how from a SILO bartender. Now that you are a pro at making a top notch Bloody Mary, test your skills with us this Sunday, July 23rd, as we welcome Strangled Darlings to our patio for an afternoon of… what else, but: Music and Marys. Pups welcome on the patio! Just look at that happy face. Want to have your own private event here? Find out how! Stay tuned for the next Skinny Sunday! Welcome to our inaugural blog post! As I’m writing this on July 4th, our nation’s Independence Day, it seems fitting to explore a brief overview of the history of distilling as it pertains to America. Enjoy! “As American as apple pie” is a phrase known to most of us, and while pie certainly reflects America’s agricultural past, distilling (and perhaps to a greater degree, whiskey) also has a rich and stirring history. Whiskey came to the American colonies with the first European settlers, namely Scottish and Irish immigrants, and became quickly embedded in the day-to-day lives of the colonists. During the Revolutionary War, whiskey and rum were among the most valuable commodities and were frequently used as currency. While rum was undoubtedly popular, the war contributed heavily to its decline and the rise of domestically produced whiskey. Most whiskey at this time was made from rye, though corn whiskey would develop in a region of Virginia known as “Kentucky”. Fun Fact: In the early 1800s, Allegheny County, PA was producing a half barrel of whiskey (typically rye whiskey) for every man, woman, and child living in America. So prolific was this spirited commerce that many tariffs and taxes were levied against the production of distilled and fermented beverages. In 1791, the “Whiskey Tax” was established as an excise tax applied to distilled spirits. This led to widespread rural unrest and eventually culminated in the aptly named “Whiskey Rebellion”. Farmers who had been distilling their surplus grain protested against the new tax and some even raised up arms against the tax collectors. President George Washington retaliated with force and eventually pardoned those “whiskey boys” who were caught. Whiskey consumption continued to soar, peaking in 1830 with an annual rate of seven gallons per person older than fifteen. Consumption then plummeted with the advent of the Temperance Movement. 1845 saw an average per capita consumption of 1.8 gallons. With the Civil War, spirits again became a valuable economic good. The “Noble Experiment” of Prohibition arrived with the Eighteenth Amendment in 1920 and banned the production, sale, and use of alcohol in the United States. One could, however, get a prescription of medical whiskey from a doctor. Prohibition was repealed in 1933 after it failed to curb alcohol consumption, instead contributing to a rise in organized crime and binge drinking. Did You Know? In 1964, congress declared bourbon whiskey to be the nation’s official distilled spirit. The American Craft Spirits Association defines a craft distillery as an independently licensed distiller producing fewer than 750,000 proof gallons (a gallon of alcohol at 100 proof) annually. Founded in 1982, St. George Spirits in Alameda, CA is widely considered to be the first craft distillery in the United States. As of August 2016, there are as many as 1300 craft distilleries in operation nation-wide. With the success of the craft beer industry paving the way, craft distilling is witnessing unprecedented growth. While “As American as bourbon whiskey” doesn’t quite have the same ring to it as its Apple Pie cousin, it can’t be denied that our nation’s past is tied inextricably to that of distilling. Fireworks, barbecues, and a cold beer may still be the hallmark of Independence Day, but a nice red, white, and blue cocktail or a dram of whiskey have their patriotic nods, too. No matter which way you roll, stay classy and stay proud.